RANCHO CORDOVA, CA (MPG) - The Rancho Cordova Police Department (RCPD) is pleased to introduce you to the newest member of the Youth Services Unit that supports Rancho Cordova schools: Detection K9 Zoe! Zoe is a 20-month-old German shorthaired pointer who is focused, driven, playful and friendly. On July 6, Zoe became certified to California Peace Officer’s Standards and Training, which followed a 120-hour training course from Top Dog Police Canine Training Center. She is trained to identify narcotics, firearms, ammunition and explosives to help keep our students and schools even safer. Zoe will be partnering with School Resource Officer Steve LeCouve. When he became a School Resource Officer, local school districts were looking for innovative approaches to address the changing landscape of schools, as well as drug and weapon searches. Officer LeCouve believes having a detection K9 is a groundbreaking effort geared toward school safety. Officer LeCouve’s favorite and most rewarding job over his 30-year career in law enforcement has been as a K9 Handler. 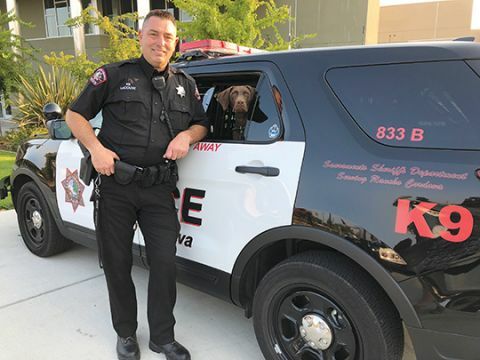 The detection K9 program, which includes our detection K9 and a marked patrol car, are funded by the City of Rancho Cordova’s Community Enhancement Fund, which is supported by a ½ cent, voter-approved sales tax. The Community Enhancement Fund provides an additional $1.3 million in funding to the $20 million+ annual police budget during the 2018/2019 fiscal year. We look forward to introducing you to Zoe at an upcoming event or during a visit to one of our Rancho Cordova schools! Stay tuned to future editions of The Dispatch to learn more about the Youth Services Unit. Not a subscriber? Sign up now at http://CityofRanchoCordova.org/ENews.